Prepare to live the story of Rokugan, with the debut of Legend of the Five Rings: The Card Game! Our previous Organized Play announcement detailed the clan-exclusive elemental role deckbuilding mechanic, the Hall of Honor for players who earn the title of Hatamoto at prestigious events, and the incredible preview events which were held at Gen Con and in London. The release of the Core Set is upon us. Participating game stores worldwide will be hosting their Launch Party events, providing the first steps on the Organized Play path for their communities. Today, we are pleased to share two more of the steps along that path for players who thirst for the glory of competition! November 1st through 5th, at the Fantasy Flight Games Center in Roseville, MN, the first Shogun will be crowned, and they alone will have the privilage of making the next Story Choice! The 2017 World Championships include a prestigious competition, side events, and a Prize Wall offering coveted items. Visit the Winter Court webpage for more information on this momentous tournament and its exclusive prizes, and wait with bated breath for the short story about the champion's Story Choice. After adding a third Day 1 heat to accomodate additional demand, we still have a limited number of seats available for purchase. Visit the 2017 World Championships webpage for attendee information, and then proceed to our ticketing portal by 9:00 AM CDT on Monday, October 9th to claim your opportunity to compete! The Toshi Ranbo Season of the Kotei Series begins two weeks after Winter Court at PAX Unplugged! These events feature a prestigious main tournament, plus many side events for players of all skill levels. The Great Clans will earn seasonal points in pursuit of three incredible clan rewards, one of which is an exclusive card for their clan's use, representing the season's namesake. Every player will receive a commemorative exclusive playmat and other prizes, in recognition of their courage and contribution to their clan's standing. Five of the approximately twenty Kotei events in the Toshi Ranbo Season are recognized as a Grand Kotei, including PAX Unplugged, UK Games Expo, and Gen Con 2018, offering variant prizes and additional points. Hatamotos will be recognized and created, exclusive prizes will be awarded, and top players will earn a free seat at the 2018 Winter Court World Championship! Grand Kotei champions even earn travel and accomodations to attend Winter Court! Visit our Kotei Series webpage for more information and locations, and follow us on Twitter for updates as more locations are added! Participating game stores will be welcoming players into Rokugan with the first of the events in the Launch Program! Three opportunities await players in the months following the release of the Core Set. The Launch Party is a casual open play event, using decks built from a single Core Set. Then, after the exclusive elemental roles for each clan are determined at the Winter Court World Championship, the Imperial Summons event calls players back to strategize and play with full decks built from two or three Core Sets, using the new exclusive role card for their clans. The last event in the Launch Program is the first tournament: players will compete in three rounds of paired games at the Way of the Rings event. Fantastic prizes, including stunning textless clan champion cards with extended art, will be awarded to attendees of each event. Visit the Launch Program webpage for more information and the instructional guide, then contact your local game store to find out when their events are taking place! 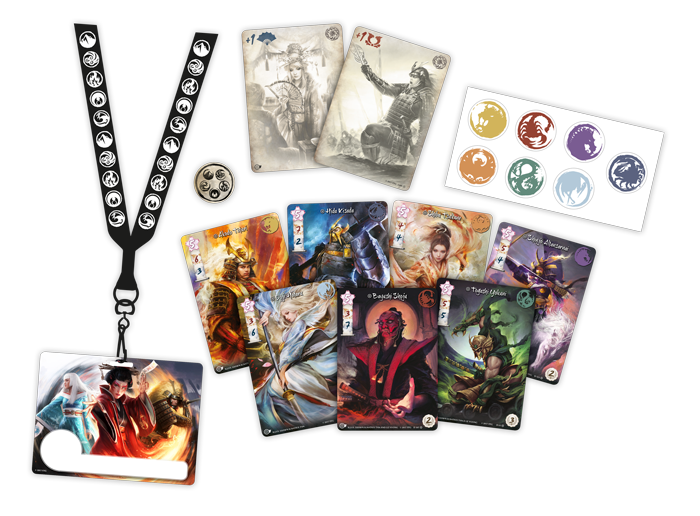 In the coming weeks, pre-orders will begin for the first quarterly in-store Organized Play kit for Legend of the Five Rings: The Card Game. This deluxe quarterly kit will bring weekly or monthly play into your local game store along with a special event, each calendar quarter! The first quarter of 2018 will feature an in-store championship to embrace the competitive spirit of local communities around the world. Stay tuned for particulars about the prizes and experiences that the in-store kits will contain! Follow us on Twitter, and sign up for the FFG Community OP Newsletter to be the first to know when these tantalizing Organized Play details are revealed! Update (January 26th, 2017) - After evaluating feedback from the first events in the Toshi Ranbo Kotei Season, the practice of chanting at the Kotei and Winter Court events has been discontinued.